Artists have been painting on wood paint panels for centuries. Many old world paintings have survived due to the longevity of the wooden panels they were painted on. Wood panels offer a solid surface to paint on and are simple to hang and display. Manufactured in the U.S.A. using 1/8" Baltic Birch facing with no seams or patches on the panel and Wisconsin kiln dried select basswood is used for the cradling. Finely sanded and ready for your primer or for use as a craft panel. By default our panels come with a 90 degree edge. We also offer a beveled edge that has a slight angle on all the edges and corners of our panels, which smooths the facing of the panel near the edges. Don't want a 90 degree edge, and want a beveled edge? No problem, simply let us know in your order comments. There is no additional charge - just choose what you like and what suites your creative personality! 1-1/2" deep cradle. Available in a variety of sizes. Custom sizes available. Please see the Custom Panel Page for more information. Available at a great discount - save even more when you buy in cases of 6! Please note: The sizes listed for the cradled wood panels are accurate within approximately 1/4" of actual size. Please see our custom panel page if you need panels built to exact specifications. Please note: The cradles of our panels are constructed of basswood, which is a soft wood by nature. Small imperfections, divots, or "smushes" can occasionally occur during transit. A panel that is received with these slight imperfections will not be replaced. Smushes like the ones shown in the photo below can be easily returned to their original shape by leaving a damp sock or towel on the surface for approximately one hour, then removing and leaving to dry naturally. 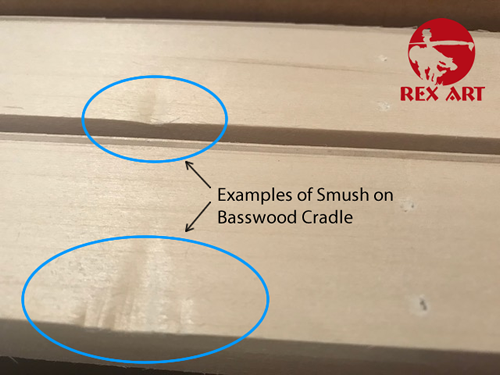 Damages to the cradle (anything other than the face of the panel) that arise during shipment must be greater than a 2" x 2" square to be claimed as damage to be replaced. 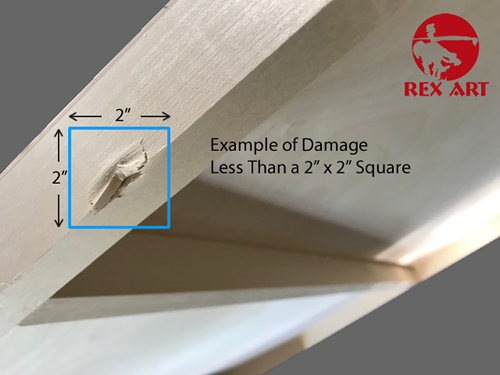 Damages that are smaller than this size (see photo below) can easily be chipped out, repaired with a small amount of wood filler and do not affect the painting surface in any way. Any damage to the cradle of the panel larger than 2" x 2" square please notify us with an email including photographs of the damage. If the surface of the panel is damaged during transit it would be replaced once pictures have been forwarded and we have reviewed the damage claim. By purchasing our panels you confirm that you have read and accepted our policy regarding panel sizing and incidental damage during transit. Thank you!